Create radiant health and wellbeing through the use of the sound and symbol OM. The Sound of OM is a Divine gift. Let the warm voice of Sri Shakti Durga, backed by the music of award winning Sadashiva, Guide you to release energy blocks in your physical body and Ignite Your Spirit. The ancient secrets of the power in the vibration of OM is now yours. Om Your Body Meditation uses the power and the sound of Om to create radiant health and well being in your physical body. Clean and heal the vital organs of your body through the sound of Om. Use your breath and intention to send healing Oms throughout your body for deep physical healing. Release pain and blockages to good health. 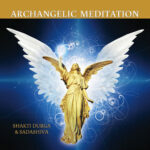 Information on the chakras and their healing qualities can be found in Shakti Durga’s book Ignite Your Spirit.